On the morning of Saturday 20th April members of Boys' Brigade, Girls' Brigade and The Guild joined together to take part in The Big Footprint. The theme for Rt Rev Susan Brown's year as Moderator of the General Assmbly of the Church of Scotland has been "walking with..." and the aim of the BIG Footprint was to get generations walking together. Setting off from Glasgow Cathedral members of the organisations, family and friends headed down High Street and Saltmarket, crossed four of the bridges over the Clyde then headed back up Buchanan Street and St Vincent Street to St Columba (Gaelic) Church of Scotland for hospitality and refreshments. Over the course of the 90 minute walk there was plenty of time for chat and getting to know new people and catching up with old friends. The Moderator was able to join us for nearly all of the journey but as we headed up the last stretch of St Vincent Street she was turning around to get the train to Edinburgh to do it again there in the afternoon. You can now download the latest Battalion Update Newsletter for April 2019, 1.5Mb pdf file. 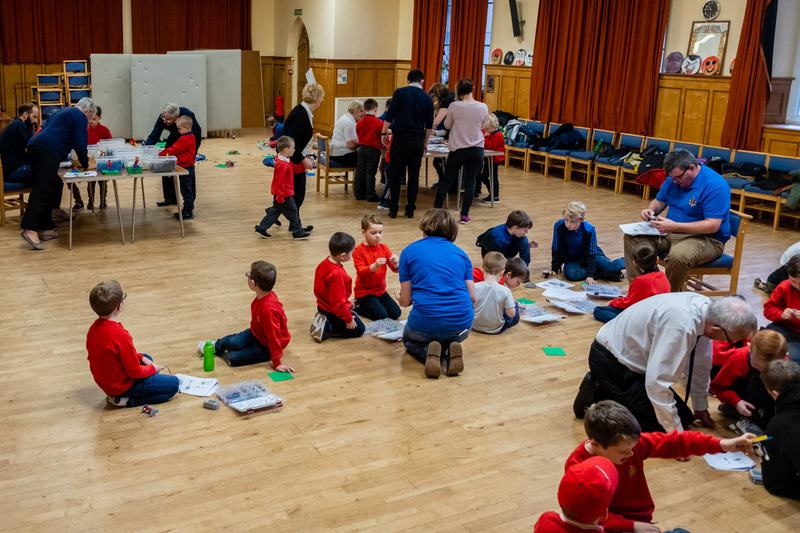 The Compass Badge Challenge for Boys in their first year in the Company Section took place on 22nd February at Shawlands trinityChurch. Comprising rounds in Bible Knowledge, Drill and BB Knowledge. In first place were 128th Glasgow, with 2nd East Kilbride in second place and 231st Glasgow A Team in third. Our Junior Section Sports was held at the Emirates Arena on 18th January, the fifth time we've held it there it was our highest entry to date with 160 Boys from 18 Companies taking part. Events were 60m, 200, Long Jump and Shot Putt for each age group (P4,P5 & P6), as well as team competitions for relay and tug-of-war. Thanks to everyone who came along, the boys for taking part, leaders for helping to run the events and the parents and family who came along to cheer the boys on. A list of medal winners is in the accompanying image. Our Annual Review for Session 2017-2018 has been posted out to all registered Leaders within the Battalion. It gives a brief insight into the work of the Battalion in the year to 31st August 2018. Available to download Annual Review 2017-18, 1.2Mb pdf file. The latest newsletter from the BB's Director for Scotland can be downloaded here, 228kb pdf file. It was our Junior Section Unknown Factor Competition on Saturday 17th November, teams from around the Battalion came along to HQ to take part in the event, the unknown element being they don't know what the activities are before hand. 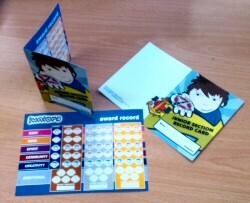 This year there was an obstacle course, a video observation quiz, general knowledge quiz and some puzzles to solve. The winners were 2nd East Kilbride "A" Team, in second place were 137th Glasgow and third were 16th Glasgow. The Battalion are saddened to hear of the passing of Dr Laurence Whitley, previously Honorary Vice-President in his then role as minister of Glasgow Cathedral. A regular attendee at Queen's Badge presentations he provided great help in 2017 when the event transferred temporarily to the Cathedral and was also a great supporter and chaplain to the 47th Glasgow (Cathedral) Company which met at the St Mungo Museum. His funeral took place at Glasgow Cathedral on Monday 12th November. Our Lego Activity Mornings for Anchor Sections have been very popular over the last three years and our latest took place on Saturday 20th October, with 40 boys from 8 Sections at HQ for the morning. Over the course of two hours boys moved around a number of different activities, traditional blocks and baseplates, making 2d characters and logos, 3d superhero figures, decorating spinning paper plates and building a battery powered dragter. If you missed out this time we're planning another date in January. Saturday 6th October saw our first Junior Section event of the session with the Underground Challenge. Teams from nine Companies set off from Battalion HQ with two hours of available time and a list of photo-challenges and fact finding at locations close to stations around the Glasgow Subway System. Did you know there are 274 panes of glass in the canopy over the Argyle St entrance to St Enoch Subway, one team counted them! Each challenge completed, question answered or photograph taken had a points value and in the end the winners were the team from 9th Glasgow. Information on our events and activities for 2018/19 can be found on the Entry Schedules page. The Anchor Section, Junior Section, Physical Activites and Drill Schedules are all now available and were posted to Captains, OiC's and Committee members on 28th September. 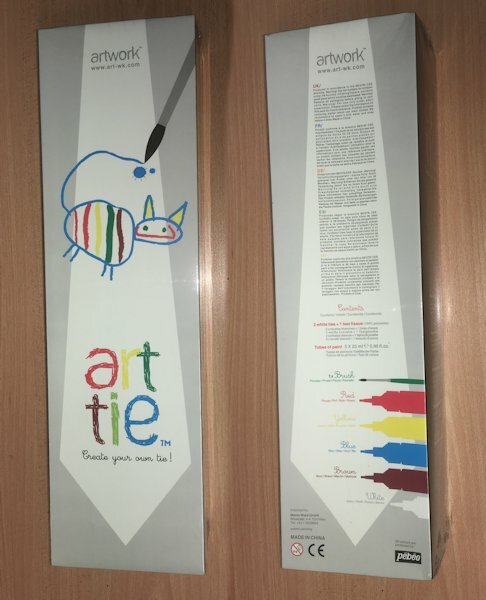 Thanks for the interest in the Design-a-Tie kits, we've now given them all away and we're looking forward to seeing the results. 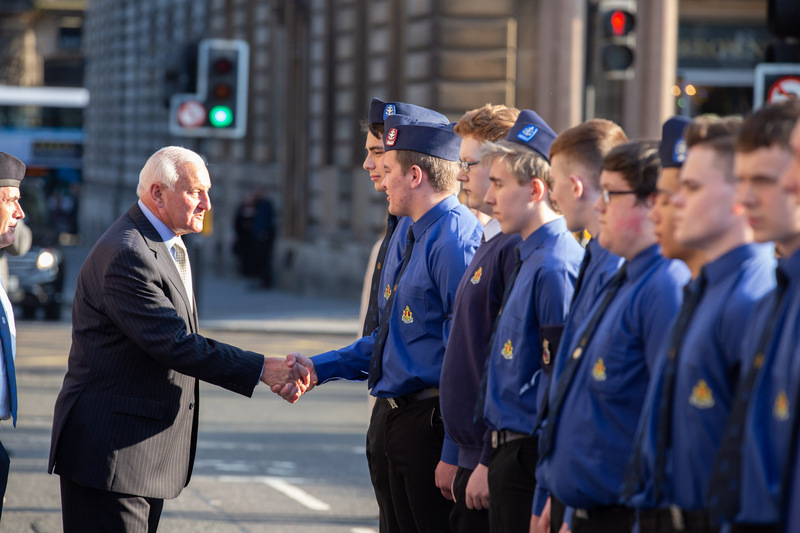 Our Queen's Badge Parade and Certificate Presentation gave the Boys' Brigade another opportunity to showcase the work that our young people are involved in as part of the organisation. 83 Queen's Men from around the Battalion received their certificates at the ceremony in the City Chambers on 24th May. Our Chief Guest, Bobby Watson, chairman of Airdire Football Club, inspected Queen's Men in George Square, presented their certificates and gave a humourous and inspiring address. Bailie Anne McTaggart, extended a welcome and congratulations from the City. It's also important to remember the work of our volunteer leaders. For Anchor Section & Junior Section leaders who see the result of the work with Boys over the last 6-10 years to Company & Senior Section staff who provide the fine-tuning and encouragement towards the end of the Queen's Badge journey. The Queen's Men are rightly proud of their achievement, as a Battalion we are proud of the dedication of those who help make this happen. 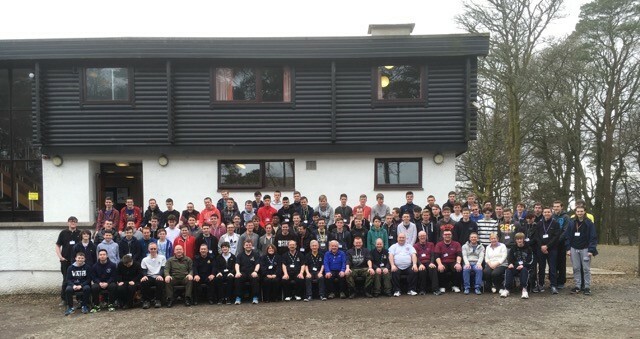 78 Seniors from around the Battalion and Lennox & Argyll took part in our Completion Residential at Auchengillan on the weekend 23rd-25th March. With a mixture of games, outdoor leadership tasks, discussion of QB work, a guest speaker on Men's Health, and a Heartstart Emergency First Aid course. There was also a Media Challenge, split into groups, each planning or filming a different aspect of the BB programme we came up with this 5 minute video, still some tidying and voice-overs to come you can watch it on our YouTube channel. Our NCO's Drill Competition took place on 17th January, 10 Seniors from five Companies took part in the competition, which sees Seniors drill a squad so it's a test of their knowledge and ability to give commands. Well done to Scott Kenny, from 79th Glasgow, who won the event, with Jason Marshall, 1st Bearsden a close second and Scott Robertson, 94th Glasgow, in third. Thanks to 163rd Glasgow for hosting the competition. The latest Battalion Update has been published December 2017 Update, 644kb pdf. It contains dates for your diary in January and February 2018, information on the Juniors Underground Challenge on 27th January, winners of the Anchors Colouring Competition and guidance on planning ahead for overnight activities and trips. It was our Juniors 100 Challenge on Saturday 30th September, we had over 120 Junior Section members from all across the Battalion at HQ to celebrate the 100th Anniversary of the formation of the Boy Reserves, now the Junior Section, and take part in a number of the 100 Challenges set by BBUK to mark the occasion, at last count 36 of them were on offer. 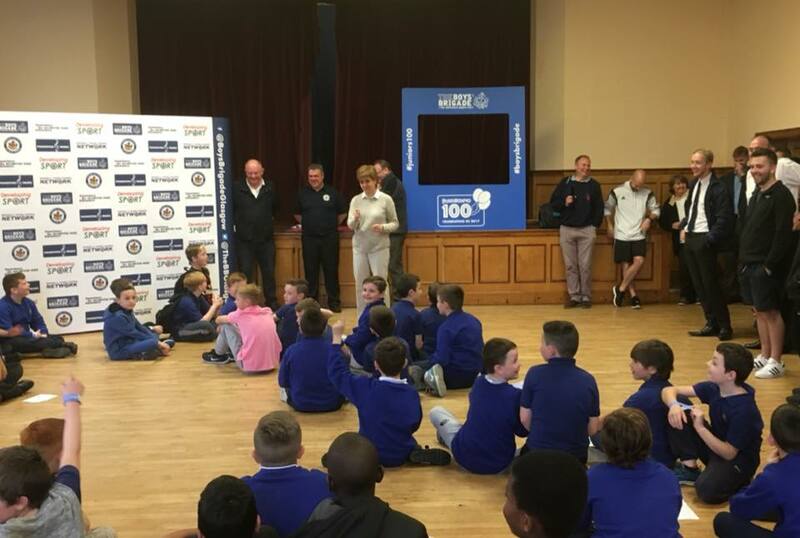 One challenge was to meet a local politician, our local MSP at Battalion Headquarters is First Minister Nicola Sturgeon and we were delighted she was able to drop in for a visit, she went round to see the activities and as the Boys gathered at the end of the event she said a few words before cutting our Juniors100 birthday cake. Other challenges on the day included plate spinning, learning to say hello in 10 languages, eating a donut without using your hands, learning a new sport, doing a 100 piece jigsaw, getting a photograph with an item more than 100 years old (the Battalion's Senior Football Trophy), designing a unifrom for 2117, building a tower with 100 2p pieces, and the list goes on. Our Junior Section Sports took place in the Emirates Arena on Wednesday 19th April, with more than 160 Boys from 19 Companies taking part. We had events for each age group - 60m and 200m races, long jump and shot putt, with team competitions in 4x60m relay and tug of war. It was a successful evening and enjoyed by Boys, leaders and parents. Thanks to all who helped with the organisation. Our annual Cross Country Championships were held at Bellahouston Park on Saturday 4th March. We had Boys from 11 Companies taking part across the three age groups. As well as individual winners we have a team competition, teams are of 3 - 5 runners with the first three finishers counting. In the Junior age (11, 12 & 13) the winner was Michael Black, 195th Glasgow, followed by Reuben Payne, 44th Glasgow and Christopher Watson-Sweeney, 278th Glasgow. The winner of the team competition was 27th Glasgow. In the Intermediate age (14 & 15) first was Calum Young, 128th Glasgow, second was Ian McDonagh, 128th Glasgow with Lewis Brown, 45th Glasgow in third place, the winning team was 45th Glasgow. And in the Senior age (16, 17 & 18) the winner was John Law, 130th Glasgow, second Jonathon Watson-Sweeney, 278th Glasgow and in third Scott Robertson, 94th Glasgow. There was no team competition at Senior age. The Company Section Table Tennis Competitions took place recently, with Junior (P7 & S1) on 24th January, hosted by 44th Glasgow. The winner was Andrew Whitelaw, 44th Glasgow, Runner Up was Blair Milne, 44th Glasgow and in third place was Scott Selbie, 278th Glasgow. 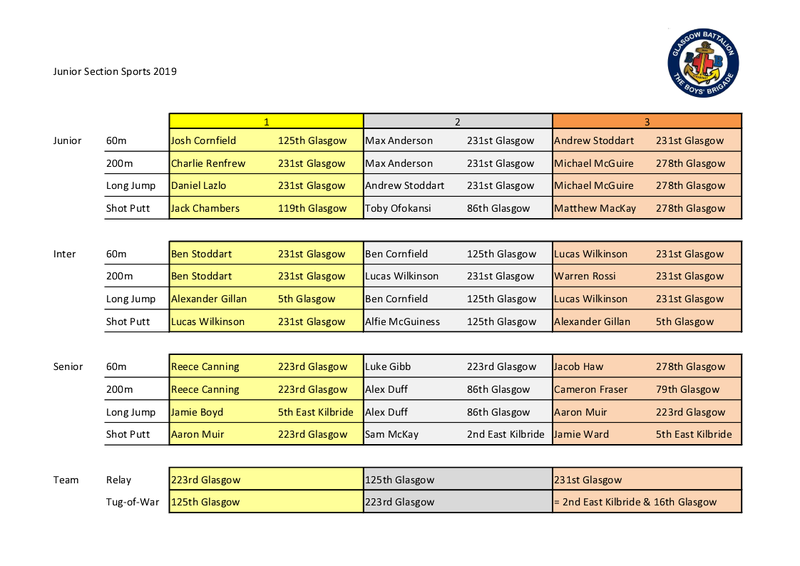 Intermediate and Senior both took place on 1st February, hosted by 5th Glasgow. In the Intermediate (S2 & S3) the winner was Jack Nairn,278th Glasgow, Runner Up was Christopher Watson-Sweeney, 278th Glasgow and in third place was Callum Sharp, 79th Glasgow. And in the Senior (S4 - S6) the winner was Greg Burnett, 79th Glasgow, Runner Up was Liam Barbour, 79th Glasgow and in third place was Scott Whitelaw, 16th Glasgow. The Junior Section Table Games competition took place on Saturday 26th November at Ibrox Church. Boys from five Sections took part in Connect 4, Dominoes and Dingbats. Squad Drill Competitions took place at Moncrieff Parish Church on Friday 25th November. In the Premier Competition for the Bowie Cup the 4th East Kilbride finished in first place, followed by the 79th Glw, 231st Glw and 94th Glw squads. The 4th East Kilbride made it a double when they gained top spot in the Championship (Unseen) Competiton for the Frame Trophy, followed closely by the 231st Glw, 79th Glw and 94th Glw. All the squads were smartly turned out and particiated in a close run event. Senior Boys from the Battalion were collecting for Poppy Scotland at St Rollox on Saturday 5th November as shoppers gave donations in exchange for a poppy. The total raised was £584.79 thanks go to those involved in the collection, several of whom were counting this as service in the community for their Queens Badge. The commemoration events to mark the centenary of WW1 are now approaching the end of the second year. Many know about the links with Glasgow institutions to the Pals Battalions, particularly that of the 16th Highland Light Infantry and The Boys' Brigade, Glasgow Battalion. 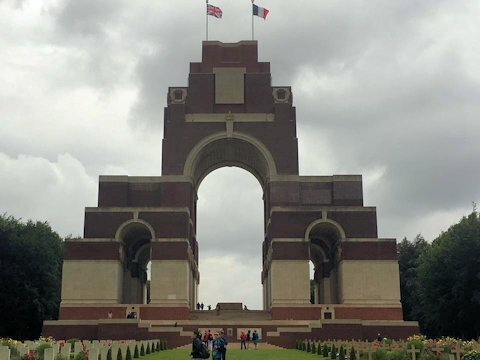 The anniversary of the start of the 5 month Battle of the Somme was marked nationally on July 1st with events throughout the UK and in France. 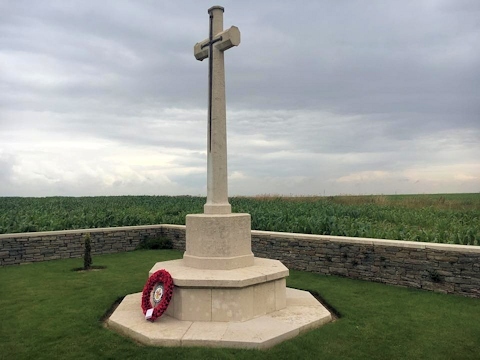 To recognise and reflect on the history of the association with the 16th HLI, Jim McVean, Secretary of Glasgow Battalion The Boys' Brigade laid a wreath at New Munich Cemetery during a visit to Thiepval, Authuille and Beaumont-Hamel. These were just 3 of the key locations where the 16th HLI fought during this battle. We have teamed up with Bala Sport to produce a limted number of Size 5 Boys' Brigade badged Fairtrade footballs. 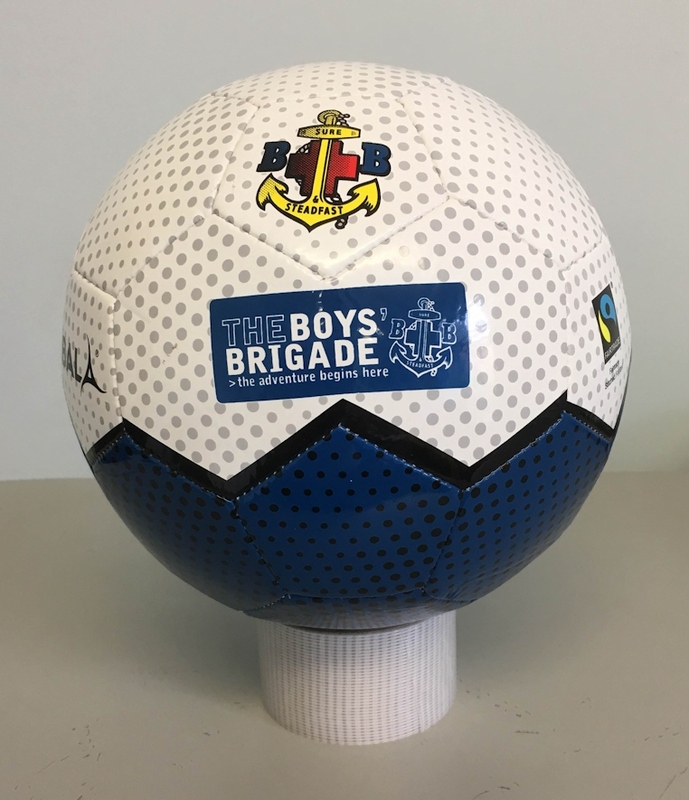 The balls are half white / half navy blue - the white half has silver/grey dot details with the BB Anchor and Boys Brigade badge on each side, along with Fairtrade and manufacturer logos, the lower half is navy blue with black dot details. They are available to purchase from the Battalion office for £15 each, they are supplied deflated for easier transport. Postage cost within the UK is £3.50 each. Contact us at the Battalion Office to order, we have them listed on eBay but they are more expensive there to cover costs of selling. The balls have been manufactured for us by Bala Sport and are hand stitched in Pakistan. Bala Sport is a co-operative style organisation, it was set up to expand the availability and use of ethically produced Fairtrade sports balls (focusing initially on footballs) in the UK and beyond. When a high quality Fairtrade certified football is sold in the UK the buyer is guaranteed that the men and women who made these hand stitched products are paid a fair wage and benefit from fair working conditions and also the additional Fairtrade Premium. Well done to our team of Seniors who won the Scottish Seniors Seven-a-Side Football on Sunday 10th April at Ochilview Park home to Stenhousemuir FC. Teams from seven Battalions took part and with four wins and two draws our team secured victory. Well done all. It's impossible to predict the weather, especially in the month of March, especially early March. So when our Residential Course at Auchengillan Outdoor Centre was scheduled for the 4th day of the month a few seasoned campaigners reflected on a previous course that had the unwelcome addition of around 15 inches of snow, unceremoniously dumped overnight on the Saturday/Sunday. This year, however, had no weather issues. We were treated to bright blue skies on Saturday which repeated on Sunday till around noon, allowing the activities to proceed as planned. 78 Queen's Men representing 23 Companies from 3 Battalions together with 15 members of the Battalion Training Team took part in the course, supported by our dedicated Catering Team who ensured a well-balanced meal was provided at every agreed time. From our Icebreaker session on Friday evening through to Sunday afternoon the Boys played their part in ensuring the course went well. Teambuilding, Leadership, Communication, Presentation and Persuasion skills were employed throughout the outdoor 'Recreational Activities" ensuring that amongst other tasks the Pipe was filled with water, the Nuclear Waste was transported safely and everyone exited the Blindline course safely but definitely not without mud on their clothes. Our group spent time learning Heartstart techniques, prepared some fantastic 'Dragon's Den' proposals that we will hopefully see delivered on the ground and showed that some only have a face for radio in the Media Challenge. They now go back to their Companies, some to finalise hours for volunteering or add to Skills and Physical sections, with the knowledge that they can join together at the City Chambers in Glasgow on 2nd June to receive their Queen's Badge Certificates. The Battalion Swimming Gala took place on Sunday 13th March at Castlemilk Pool. Anchor Boys from three Sections took part in a Float Race to start the afternoon off. Junior Section events were held for each age group in Free Style and Breast Stroke, plus a relay race. 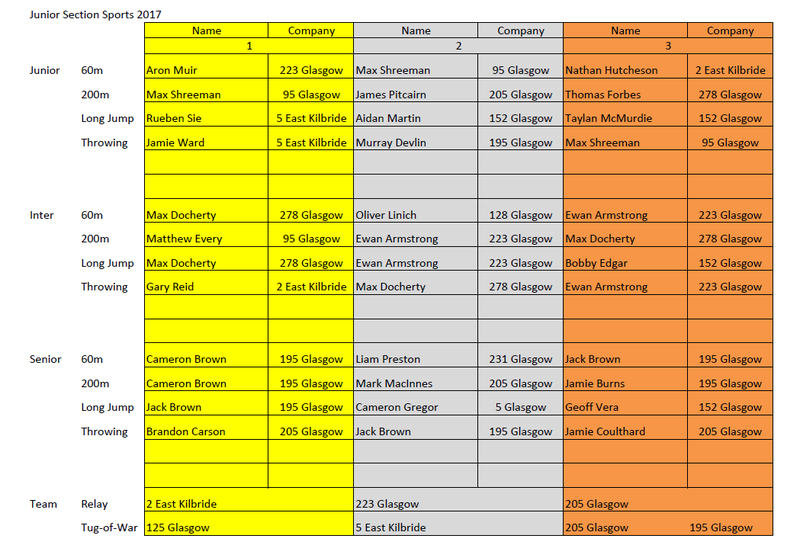 12 Junior Sections took part with the 205 Glasgow scoring the most points across the events. Company Section was also split over three age groups, again with Free Style and Breast Stroke plus an open longer distance Free Style, Back Stroke and relay races. Nine Companies took part with 32nd Glasgow taking home the Church Memorial Swimming Trophy. Saturday 12th March saw two Junior Section events take place the Figure Marching and the Bible Knowledge Quiz. Five Sections took part in the Figure Marching with the 27th Glasgow winning. The Bible Knowledge has individual winners at each age group for the Juniors it was Jonathan Hooper from 137th Glasgow, Intermediates - Nathaniel Turner, 45th Glasgow and Seniors - Peter Hunter, 9th Glasgow. The Bible Knowledge scores are also totalled across all the age groups and the winning Section was 137th Glasgow. The final Competition's of the Sessions Drill Calendar took place on 11th March with both the Company Drill and Limited Squad Drill competitions. The Company Drill competition for the Garroway Cup is the oldest competition still contested in the Battalion and sees two squads of Boys drilling as one Company, this year it was again won by 79th Glasgow. The Limited Squad Competition is open to all, and requires just six Boys for a squad, this was won by 94th Glasgow with 27th Glasgow second and 4th East Kilbride in third place. The Battalion Cross Country Championships took place at Bellahouston Park on Saturday 27th February, with 48 Boys taking part across the three races. It was a fine day for the event, clear skies although a little cold, ideal running weather. The Battalion's Table Tennis Championships were held over two evenings this week. The Junior event was held on Tuesday 26th at 44th Glasgow's Jubilee Halls, Andrew Whitelaw of 44th Glasgow won, with Sam Milne, 44th Glasgow runner-up and Jake Webb also 44th Glasgow in third place. The Intermediate & Senior events were held the following evening on Wednesday 27th, hosted by 5th Glasgow at St John's Renfield Church, Calum Young of 128th Glasgow won gold, with Scott Whitelaw, 16th Glasgow taking silver and Callum Sharp, 79th Glasgow bronze. The Senior event was won by Greg Burnett of 79th Glasgow, with Liam Barbour, also 79th Glasgow, second and Patrick Baird, 16th Glasgow, third. More than 130 Boys plus Leaders attended the Battalion Anchor Section Pantomime at Headquarters on Saturday 5th December. This years panto was Jack and the Beanstalk, it's the fourth year that we have had the Hopscotch Theatre Company come to us to put on the show and plans are already in hand for next year. The first of the Session's Battalion Drill competitions took place on Friday 27th November, with both the Premier Squad Drill and the Championship Drill taking place. The difference between the two is that Companies have the Premier Squad Drill paper in advance and can put in a good deal of practice to perfect their routine, while for the Championship event Squads see the paper a few minutes before they go on and it's therefore a real test of the Boys Drill. Three Companies took part, 4th East Kilbride, 79th Glasgow and 231st Glasgow. The Premier Squad contest was close with 4th East Kilbride narrowly beating 79th Glasgow, in the Championship Drill the 79th Glasgow won, 4th East Kilbride second and 231st Glasgow third. Andrew Johnston took some time to visit Glasgow Battalion whilst in the city to attend a Scotland Regional Committee event last weekend. Despite the remnants of Storm Abigail bringing cooler weather to Glasgow Green, time was spent at the Company Section 7 a side football league followed by a drop in to Battalion HQ to see the results of the Piping & Drumming Course end of session concert. Our Pipe Band made their competitive debut on Saturday 15th August at the World Pipe Band Championships at Glasgow Green. The band is comprised of young people and leaders from a number of companies within the Battalion, many of whom have taken part in the Piping & Drumming courses held annually since 2010. They compete in grade 4B and came in 13th place from 18 in their qualifying heat, there were three heats with the top six from each going on to the final. This is a great achievement which members can be proud of. Particular thanks go to Bryan Sinclair, our Pipe Major and the leader who had the vision five years ago to start the Piping and Drumming course. Having got a taste of competition the band are off to Rothesay on 22nd August to compete in the Rothesay and Cowal Games. As you start to plan for the new session we'd like to highlight that we still have stock of our Anchor and Junior Section Record cards. There are two designs - one for Anchor Boys and the other Junior Section - which will last a Boy through his time in the section. 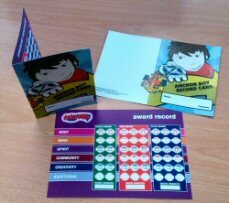 The cards are A6 in size and have space to initial or date against each activity a Boy completes allowing him to keep track on his progress towards his badges. They are priced 10p each. We had eight Seniors through in Edinburgh on Sunday 17th May to play a part in the Guard of Honour for the Lord High Commissioner before morning worship at the General Assembly of the Church of Scotland. A total of around 90 Boys mainly from Edinburgh & Leith and supported by other Battalion's like ourselves, formed up outside St Giles Cathedral. Thanks to the Boys who represented us, from 5th, 79th, 128th and 208th Glasgow Companies, they were a credit to the Battalion. The Battalion's Inter-District Athletics Championships took place at the Emirates Arena on Wednesday 22nd April, each of the five Districts were represented for this Company Section and Seniors event. The Junior events for P7 & S1 were 60m, 200m and 800m, Long Jump, High Jump and 4x100m relay, for Intermediates (S2 & S3) and Seniors (S4-S6) the events were 60m, 400m, 1500m, Long Jump, High Jump and 4x100m relay. Cathkin won the event with Eastwood and Springburn tied for second, Eastern fourth, then Partick. 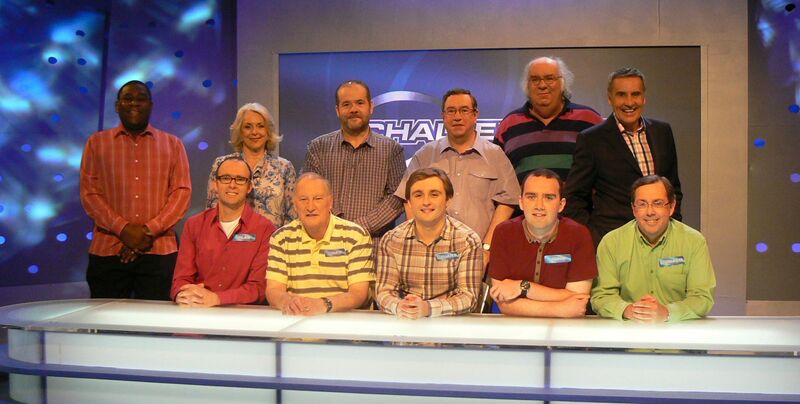 A team of BB Leaders from Glasgow and Coatbridge took on the Eggheads on the BBC show on 25th September. Some time ago we asked for volunteers to put a team together to take on the Eggheads, some of the leading quiz brains in the UK, and we had six people take up the challenge. The five on the show are Alan Brown, 45th Glasgow; Brian Horne, 163rd Glasgow; Stuart Rankin, 15th Coatbridge; John Armour, 268th Glasgow; and Donald Armour, RO; our sixth volunteer and reserve was Jordan Watson, 1st Cumbernauld. The team put in a good performance, knocking out two Eggheads along the way and taking them to sudden death in the final but ultimately losing out. As the World marks the centenary of the beginning of the First World War, Boys from the Battalion and across the UK were involved in the commemorations in Glasgow on Monday 4th August. 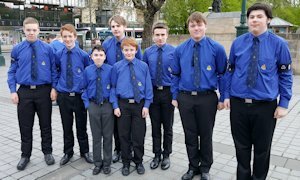 10 recent Queen's Men from Northern Ireland, England and Scotland, including Glasgow were among 60 young people from the voluntary youth organisations to line the route for guests attending the service in Glasgow Cathedral. Following the service guests moved on the George Square for a wreath laying ceremony at the Cenotaph and another group of Boys from Glasgow Companies, along with Guides, Scouts, Girls' Brigade, Army, Air and Sea Cadets from the Glasgow area were present outside the City Chambers. The Battalion Pipes and Drums were playing at Festival 2014 at Glasgow Green at lunchtime on Friday 25th July, entertaining the crowds enjoying the Commonwealth Games atmosphere in Glasgow. They'll be back in Glasgow Green on Saturday 2nd August and before that you can catch them in George Square on Wednesday 30th July at around 1pm. 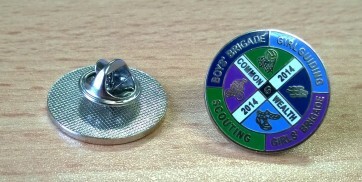 We have received a new supply of Commonwealth Badges and are taking orders. They are 22mm metal pin badges from a design by Duncan Colquhoun of the 95th Glasgow BB. 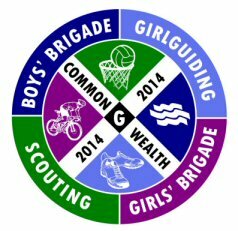 We held a joint competition with the Scouts, Guides and Girls' Brigade in Glasgow last session to design a badge to be used by the four youth groups in the city to mark the Commonwealth Games. They are available from the Battalion office (£1 each plus postage), email us to order, and we have been selling them through eBay at £1.75 each including postage. Kenny MacAskill MSP, the Scottish Government's Cabinet Secretary for Justice visited Battalion Headquarters on Tuesday 9th April to hear how some of the Cashback money is being used to develop our programmes. Boys from 182nd and 200th Glasgow companies came along to show some BB activities and he heard about other projects including the Seniors Uganda trip. More than 500 youngsters aged from 5 - 11 from the Glasgow area took part in the 'Get Active Day' on Saturday 2nd March at the Kelvin Hall. Organised by The Boys' Brigade in Glasgow as part of the city's Joint Voluntary Youth Organisations Commonwealth 2014 project. 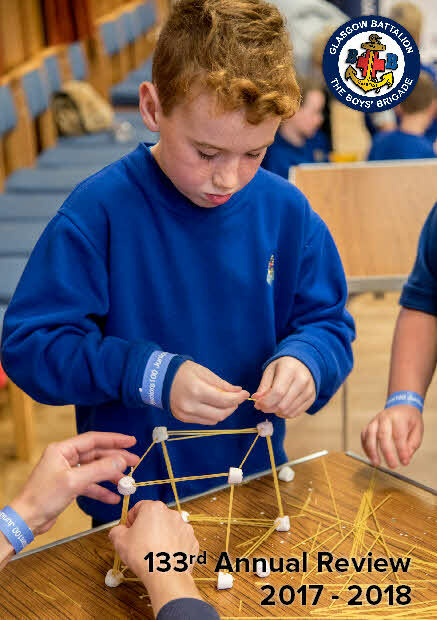 Boys' Brigade Anchor Boy & Junior Section members were joined by Girls' Brigade Explorers & Juniors, Girlguiding Glasgow's Brownies and Clyde Region Scouts Beavers & Cubs. The activities included an obstacle course, line basketball, a treasure hunt quiz, team games and staff from Glasgow2018 came along to talk about Glasgow's bid for the 2018 Youth Olympics. The Diamond Jubilee Baton visited Glasgow on Saturday 18th August on it's trip around the UK. Every year the Boys' Brigade sends greetings to Her Majesty Queen Elizabeth II, our patron, and her response is read to those at Brigade Council. Usually messages are exchanged by post but this year to mark the Diamond Jubilee the message was delivered in person to Her Majesty at Balmoral and her response was placed in a baton to be taken around the UK and opened at Council in London on September 15th. Rev Neil Galbraith, Battalion Chaplain, along with Boys from 9th, 83rd and 200th Glasgow Companies received the baton in George Square. The Boys then took it on a whistle-stop tour of the city. In keeping with the idea of the baton using as many forms of transport as possible during its trip, the baton was transported by foot, electric car, Subway, Fire tender, Skis, zip wire, as well as setting foot on many more forms of transport at the Riverside Museum and the tall ship Glenlee. Along the way the baton visited the building on North Woodside Road which was the original meeting place of the First and ended the day at Battalion Headquarters. We are now on Twitter - @TheBBGlasgow - follow us there where we'll be signposting updates to the website and our facebook page. Conducted by Company Chaplain, Gordon Kirkwood and attended by guests including Brigade President, Sir Kenneth Calman, Honorary Brigade President John Neil OBE and both the Brigade Secretary, Steve Dickinson and Director for Scotland Bill Stevenson, the Boys learned about early experiences of Boys' Brigade camps from a number of contributors and the effect it has had on their lives. Jack Unsworth, an Honorary Officer with the 1st Glasgow had attended his first 1st Glasgow Camp in 1961 and recalled how it influenced his work with the 8th Stirling when he joined them as an officer and modelled their camp experiences on his time at Portavadie, the site of camps from 1919 through to the mid 70's. 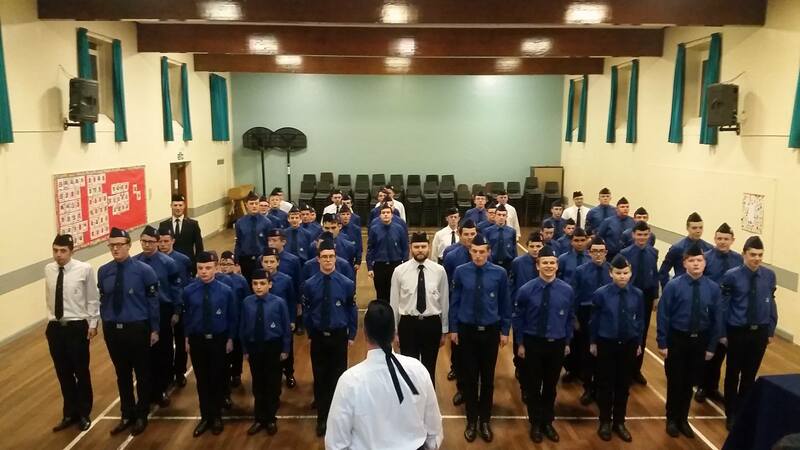 The Boys attending camp received 125 badges and certificates from the Brigade President who also unveiled the Company Certificate showing the names of all attending this year's camp. Paisley is the closest BB Supplies Shop to Glasgow, you may wish to phone first to check that the items you require are in stock. You can also order online from the BBUK Website. Opening hours: Monday - Friday, 10am - 1pm; Saturday, 10am - 12noon.